Usually there aren’t too many kangaroos roaming around in Austria, and Austria is best known for the Bundesheer. Sumsi disappeared from a private zoo in the southern village of Preding about two months ago and is keeping locals busy by popping up and then quickly getting away again. 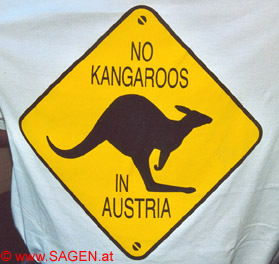 Tourists to Austria can buy T-shirts with the slogan “No kangaroos in Austria” because this European country is sometimes confused with Australia, where the marsupials are native. Recently, local firefighters sealed off a corn field after a Sumsi sighting – but to no avail. Not even a feeding station set up by kangaroo-crazy kids has done the trick. Zoo operator Magrid Brauchart said Thursday she’s convinced the five-year-old male was stolen and worries her charge could get hurt. This entry was written by Chaos, posted on August 20, 2010 at 4:54 pm, filed under Random and tagged austria, kangaroo, marsupials. Bookmark the permalink. Follow any comments here with the RSS feed for this post. Post a comment or leave a trackback: Trackback URL.